To celebrate my survival into my mumble..mumble..ieth New Year I bought myself a new camera. To be honest it’s probably too good for me and I still haven’t worked out how to use it properly. Nevertheless I needed something to take a picture of. Wandering around Selfridges I noticed the Jack O’Shea concession in the food hall was being manned by the, er, man himself. 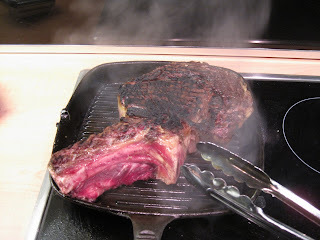 So after a quick confab we decided a kilo of grass-fed, aged beef on the bone would do the trick. It’s worth buying beef from Mr O’Shea just to see his butchery skills and soon my steak was ready. 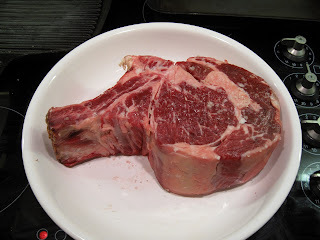 · First and foremost get a decent piece of meat and if possible get it cut to order, preferably thickly. 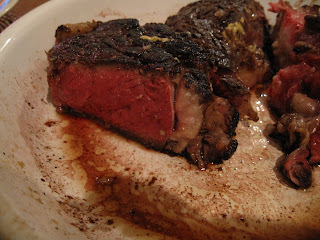 · Lightly sprinkle rock salt over the steak at least an hour beforehand. This time I experimentally upped the salt quotient and the texture fell apart a little at the surface, so don’t overdo it. 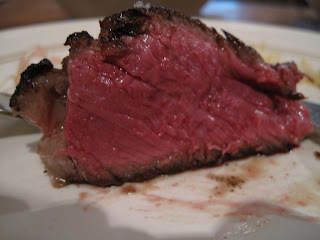 · The meat must be at room temperature before cooking. 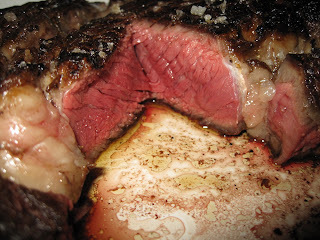 · The salt will draw some moisture to the surface of the steak which must be ruthlessly expunged. · Get your grill pan very hot. 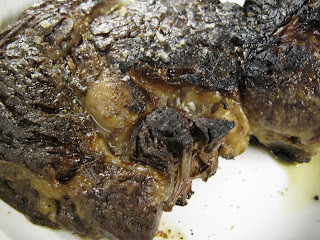 · You don’t need to oil either the pan or the steak. · Cook to your liking. I like it rare, baby. 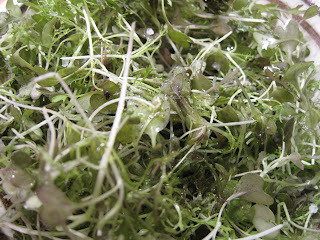 · Put it into a low oven. I put mine in for about ten minutes. I also put a little butter on top which mixes with the meat juices to form a rudimentary sauce. The time spent in the oven allows the steak to warm through completely and ensures an even colour. · Use a good steak knife – I use some rather nice ones from David Mellor (no, not that one). · Lose the mustard and horseradish. When the product is this good most condiments are an unnecessary diversions from the taste of the meat. 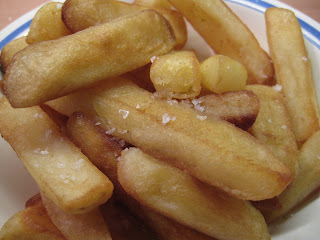 Having said that a little homemade béarnaise always goes down well and gives you something to dip your chips in. Oh and lest you worry that I was tackling rather a lot of meat there was a small bowl of dressed microgreens on the side to counteract all that flesh. My diet is nothing if not balanced. B) open windows whilst closing internal doors. Bit parky out there at the moment. By a low oven, do you mean 120C or so? Ovens vary so it's best to experiment but here's the thing: if you've only given the steak a quick blast on the griddle, resting it at 100-200C will not overcook. So don't sweat it. BTW you know Moens sometimes do aussie wagyu rump for 29.99/kg (no I didn't miss the "1" off the start). No idea why its so cheap when you ask them they mutter about differential pricing structure on the animal (maybe they bought it off the back of a lorry from some bloke who had an extra one to deliver?). Got a nice big piece this Sat. Not quite as tender as ribeye but delicious and fantastically marbled. Ring ahead - they don't always have it in. Love the steak posts. FYI, there's an offer on steaks at Whole Foods at the moment (£16 odd for a ribeye that usually costs £25), and for my money they sell the best beef in London. You should check them out.